Range: Central and Western Texas, through Southern New Mexico, Arizona, and into Southern California. Habitat: Dry, rocky, shrub covered terrain where they can conceal themselves. Status: Aggressive and easily excitable. Notorious for its fatal bite! Diet in the wild: Rabbit, mice, rats, gophers, sparrows, and ground squirrels. Diet in the zoo: Rats, mice, and rabbits. Largest rattlesnake in North America. Ranging in size from 3 feet to as long as 7 feet! Has heat seeking pits below nostrils. The coloration can vary from gray, brown, pink, or yellow, with light brown to blackish diamond shaped blotches, which face towards the tail. The tail has black, white, or light gray with rings around it. There is a lightly colored stripe from the corner of the mouth to behind the eyes. The Western Diamondback Rattlesnake, Crotalus atrox, Crotalus comes from the Greek word crotalon meaning a rattle or a little bell; atrox comes from the Latin word atroc which means hideous or savage. The diamondback rattlesnake has one of the most serious bites with the highest fatality rate in North America. The Diamondback is also the heaviest of all poisonous snakes. This rattlesnake is classified among the pit vipers. Vipers have a head broader than their neck, eyes with catlike pupils, and thick bodies. 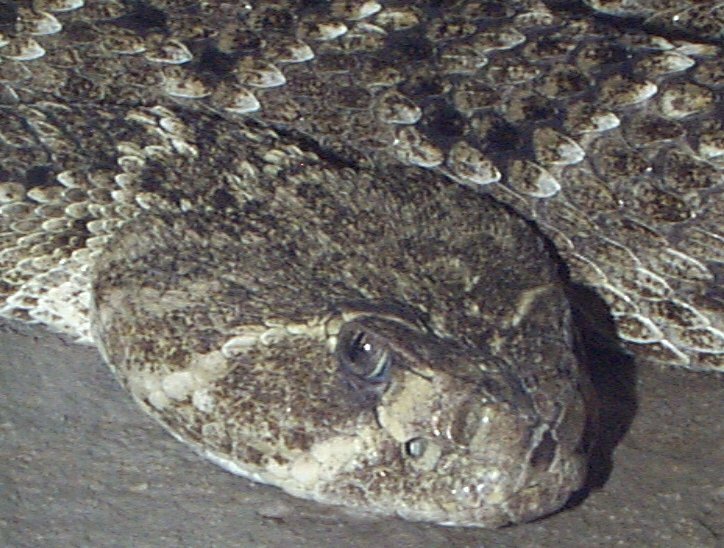 The Western Diamondback is a rigid snake and has the reputation of standing its ground. Just like all of the rattlesnakes, this species is venomous. They are not actually prone to attack offensively, but are extremely defensive. This particular snake assumes the threat posture by slightly flattening the body, rolling it together in a spiral, lifting the forebody from the ground into an S-shape, all while keeping the tail raised and the rattle rattling! This snake can lift its forebody up to 80 cm.. in the air. Crotalus atrox will reach its sexual maturity at three years. Following hibernation, mating will occur in the spring. Males may engage in dominance displays or "combat dances" in which they rear up and then wrap their bodies around each other. Click here to read a description of these combat dances. . The female diamondback is passive during the mating process, while the male snake will crawl in jerks on top of the female snake, all while he is flicking his tongue. He then will jerk the hind portion of his body vigorously, pressing his tail beneath his partner, who in turn will lift her tail. Their cloacas will make contact, and copulation will occur. The gestation period will last for 167 days! The birthing process may last for three to five hours and produce ten to twenty young. The young will puncture their thin egg membranes right before birth and are born alive! The Western Diamondback rattlesnake is a viper, and the vipers have a pair of long hollow fangs in the upper jaw. Their poison is sent out through the two teeth. When the fangs are not being used, they simply fold back into the mouth. Like shark's teeth, the fangs are continually replaced, with new fangs moving into position about every 60 days. The venom is primarily hemotoxic, attacking blood vessels, blood cells and the heart. Snake venoms are derivatives of digestive enzymes and venom injection is as much a process of "tenderizing" the prey as of killing it. Although about a third of time, the snake bites defensively without injecting any venom, a bite by this particular snake is quite serious and potentially dangerous if medical attention is not sought immediately. A snake preparing to strike will gather its body into a defensive coil, from which the upper part of the body can be rapidly extended forward. The speed of the strike is too fast to be followed by the human eye. If provoked into striking repeatedly, the snake will begin to tire and move more slowly. The snake need not be in this position to bite, however; it can strike from any angle, even underwater. As its name suggests, the diamondback also has the rattle for on the end of the tail. The sound produced by the rattle is a warning sign indicating that the snake is agitated and may strike; however, rattlesnakes may also strike without a warning rattle. The rattle is a set of horny pieces loosely joined together, made from molted skin. As the snake ages new rattles are formed with each molt, while old rattles fall off. The diamondback will always lift the tail when it sounds. Some other snakes also vibrate their tails when disturbed, but the sound of the rattle is a dramatic addition to this behavior. This venomous snake has a pit organ which is in an indentation of the upper jaw between the nostril and the eye. The pit is about 5 mm deep, with an outer and inner chamber separated by a thin membrane. The pits are heat sensing organs that help detect warm blooded prey. Its primary food items are birds and mammals, but it will also eat reptiles and amphibians, invertebrates and an occasional fish. The snake adjust its activity periods according to temperature, active during the evening in hot weather and during the day when the weather is cooler. The Diamondback Exhibit in Texas Wild! is nicely done. The actual snake itself is quite large with a rather plump body, short tail, and a broad head. The zoo also provides a display of a diamondback in an upright position, which looks real, and the sound of its tail completes the overall effect. Also provided for you are some facts about this particular snake displayed nicely on a wall by the cage of the "real" Western Diamondback!" Don't be fooled, because one of the exhibits is not a real snake!! This particular snake is just amazing! It has such beauty, yet the power it possesses through its strength and poisonous venom is incredible. The snake in the Texas Wild! exhibit was not too active, yet this is snake we're talking about. Although this species is active during the day in cooler weather, it tends to lie quietly, depending on camouflage against its natural background. The World Book Encyclopedia, Volume 15, 1985.